Yeah, you read it right. Burgerville Records. This is the biggest corporate coup since Andy Pribhol (Pribal) hooked up with Plaid Pantry. And before you start turning up your nose at the Burgerville connection, there are a couple of things to remember. First, Burgerville is locally owned. If you, like me, participated in Bank Transfer Day, moving your money into a local bank or credit union, then you’ll appreciate the fact that Burgerville is a locally held business, founded in Vancouver (they recently had to close the original store after fifty years of service). As much as a fast-food hamburger joint can, they have committed themselves to going green whenever possible. They are sustained one hundred percent by wind power. They compost their food waste and conscientiously recycle. They have even begun offering occasional live music events at the Hawthorne Boulevard location in Portland, featuring a variety of local bands. The mood is Fellini-esque, to be sure, but one can take comfort in knowing that the French Fries incense is one-hundred percent trans fat-free canola oil, which is then recycled (about ninety thousand gallons a year). Even a vegan would have to admire their business practices. In the spirit of all this, comes the debut recording for the Burgerville Records label. And, as if that were not cache enough, one-hundred percent of the profits from sales of this album will go to the Brian Grant Foundation, a non-profit organization that serves as a resource for people stricken with Parkinson’s Disease. 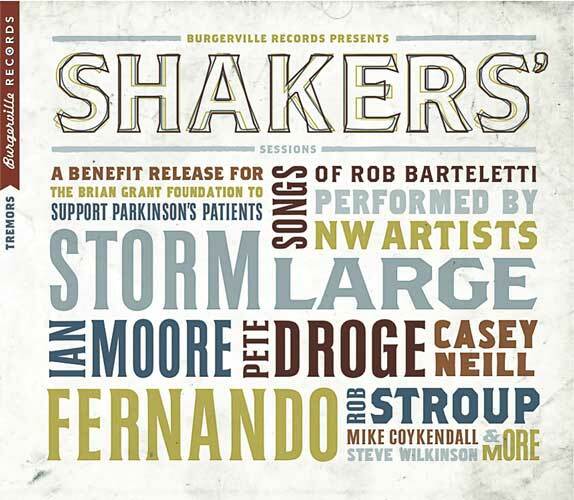 Shakers’ Sessions is a compilation featuring an array of Portland-connected artists, including, Pete Droge, Storm Large, Fernando Viciconte, Steve Wikinson (Gravelpit, Mission 5, Wilkinson Blades), Bart Ferguson (Renegade Saints), Austinite Ian Moore (of the Lossy Coils), and Rob Stroup (Baseboard Heaters, The Blame) singing songs penned by Portland musician, and Parkinson’s patient, Rob Barteletti. Given the circumstances, some stink has been made locally over the euphemistic title of this venture. Those making the complaints would probably be horrified to know that the annual benefit for Parkinson’s organizations is called the “Shakers’ Ball” and that this project started out with the working title Tremors. In his book “Always Looking Up: The Adventures Of An Incurable Optimist” Michael J. Fox says that one advantage of Parkinson’s Disease is that the uncontrollable, jerky movements can turn any regular toothbrush into the most powerful electric model. Then there’s Fox’s involvement with the Shake It Up Foundation for Parkinson’s research in Australia. Whole lotta shakin’ goin’on. The point here being that it would appear as if those afflicted with the disease seem to be desirous of maintaining a sense of humor and a positive outlook regarding their predicament—a perspective that might benefit some of those who criticize from afar. Barteletti is no stranger to the local music scene, putting out a solo album, Sombrero, in 2005 and sharing the bill with Reina G. Collins for another release in 2007. Ferguson and Nick Peets have lent Barteletti support over the years and contribute tracks to Shakers’ Sessions as well. With the addition of selections from Casey Neill (Norway Rats), the celebrated Mike Coykendall (Old Joe Clarks), Ken DeRouchie and Barteletti himself, the result is a well-rounded set of a dozen very capably crafted songs. Cohesive, from song to song , yet uniquely different from one to another. Stylistically the material falls in the folk/rock category, but with threads of traditional, country and blues sewn through the fabric as well. The support band(s) is (are) not named anywhere that I can find (at this advanced date), though it sounds as if the same players back each cut—workman-like performances, which add skillful tertiary washes behind the specific primary colors of the individual singers. Rob Stroup serves as producer and facilitator without whom, it is certain, this effort could not have been completed. “Mr. Heartache” bears a strong resemblance to the chorus of James Taylor’s “Fire and Rain” (with a breath of John Denver’s “Rocky Mountain High” blowing through the turns and a hint of Merilee Rush’s “Angel of the Morning” at the chorus) and Nick Peets’ vocal bears much of the same easygoing resignation as Taylor’s. A “John Barleycorn” motif informs Ian Moore’s version of “The Box.” Moore’s gruff, raspy voice underscores the palpable tension tightening just beneath the song’s polished exterior. Another winner. The highpoint of the album is Storm Large’s poignant rendition of “Voices,” a restless wind of a song, with a Stevie Nix-ian forlorn quality rustling the leaves. Storm navigates the pretty melody with expert precision, a voice full and rich, and evocative. A moving delivery frees her to soar at the most heartfelt passages with an emotional falsetto, as she sparrows winsomely the darkened limbs of a song sad tree. An AOR hit, to be sure. Lovely. Ferguson adeptly navigates the familiar waters of “Fool That Is Me,” waltzing a brash harmonica intro upon a John Prine-like mood, a desolate introspection of remorse and regret. More of a country feel buttresses Steve Wilkinson on “Bird On The Wing.” Steve calls to mind Brad Paisley or Blake Shelton, a burnished old saddle of a voice, resonant but without the country twang thang. “Love from a distance/ is like a backwards telescope/You’re looking at the cosmos baby/But it seems smaller without hope.” Not, perhaps, groundbreaking existential insight, but a pleasant homily. “Reckoning Day” bears a strong similarity to Johnny Cash’s version of “Hurt.” Mike Coykendall’s low tone and haunting delivery capture the desolation of the lyric. “It was a day of reckoning today/It was a day of reckoning for him/The fallout of his actions finally ushered in/It was a day of reckoning for him.” Stark electric guitar and soft military snare rhythms create a gray hovering aura around Coykendall’s expression of rain dreary sentiments. JJ Cale is again brought to mind, this time with the “After Midnight” chooglin’ swamp feel of “Wild Woman Blues.” DeRouchie’s turn at the vocal wheel steers a great vehicle for his gruffly nasty snarl. Yaow, Yaow! It’s moved up two keys and goes in a completely different direction, but “Under Icy Falls” unwinds with a chord progression very similar to that of “Ask Me Why.” Here Casey Neill echoes post-Kingston trio John Stewart with a rich, reverberant rendering of Barteletti’s original song, which is deeply rooted in traditional Americana folk music. Accompanying himself on acoustic guitar and blowing a bit of harmonica, Bartelletti sounds a bit like Prine, Waylon Jennings or Jerry Jeff Walker—a worn tumbleweed of a voice, bounding across the barren musical landscape of “Her Man, Her Lover, Her Friend.” It’s an inspirational conclusion to a well-accomplished undertaking. Rob Barteletti isn’t a great songwriter. However he’s a very good one. His songs and their subject matter are simple, basic. They explore everyday emotions honestly. Here, they are consistently well rendered. Pete Droge and Storm Large could easily have hits with their offerings—certainly movie soundtrack friendly. So, it’s a very good album in support of a great cause. With the proceeds from sales of the record going to the Brian Grant Foundation, money could not be better spent—nor with a bigger return on investment. The kickoff event for this release is scheduled to take place at the Hawthorne restaurant on November 15th with live guest performances by many of the musicians found here. 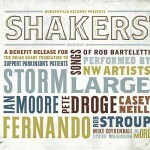 The Shakers’ Sessions album will then be available at all thirty-eight Burgerville locations, but only until January 1st (Burgerville taking a page out of the Starbucks playbook there). But hey, Burgerville’s not making anything out of this other than civic goodwill. They should be commended and supported for that, as should everyone else involved in this tremendously worthy production. link to info about show. 1 Pings/Trackbacks for "Shakers’ Sessions"